Happily, all is not melancholy here. The songs’ characters may be unloved and disturbed, but aren’t we all? The artist whose sense of irony is made of real iron is back. 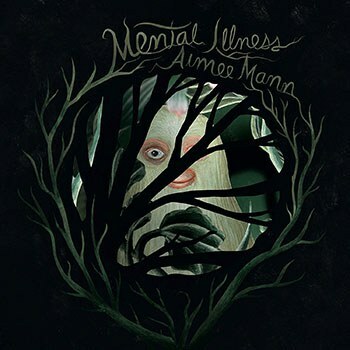 Aimee Mann knows she has a reputation for writing songs about crazy people whose eccentricities and insecurities are the only sane responses to a mad, mad world -- like the woman yelling from the audience in her MTV video for ‘Til Tuesday’s “Voices Carry” or that girl in need of a tourniquet in the movie Magnolia or the myriad of other irrational beings that populate her songs. Mann named her album Mental Illness as a wink to her fans and critics. So, here comes another cracked record! The title itself is a play on words: the songs are mental as in cerebral and ill as in sublime (re hip-hop slang). Mann understands the dual definitions. Her lyrics are full of witty puns, comic exaggerations and double-entendres accented by her sense of timing and intonations. The lines drip with bon mots that begin straight and then bend unexpectedly such as “falling for you was a walk off a cliff”, “you paid your respects like a ransom” and “even birds of a feather find it hard to fly”. She stretches short plaintive words like “why” and “please” as well as simple ones such as “that” and “by” over many seconds and syllables for effect in seemingly benign phrases such as “that is that” to carry a mix of emotionally weighted meanings. This is a Hollywood album with a setting as the place of broken dreams. Mann even references Raymond Chandler’s Carmen Sternwood (The Big Sleep). Mann is our modern day Dory Previn, whose whip-smart sensibility suggests intelligence and mania at the same time. The characters self-reflexivity deepen our understanding of their situations. The instrumentation is acoustic, so one can clearly hear every vocal expression and change of pitch. Mann plays (mostly) acoustic guitar and is backed by Paul Bryan on bass, Jay Bellerose on drums, Jamie Edwards on piano and harmonium and Jonathan Coulton on fingerpicked acoustic guitar, as well as by a string section (violins, violas, and cello). The music adds a gentle beauty to the proceedings, sometimes in contrast to the heaviness of what Mann sings about. Despite the title pun, Mann knows mental illness can be a real, debilitating condition that can have a profound impact on all involved. Her description of a person who had a psychotic break by one who loves that person on “Lies of Summer” conveys the overwhelming sadness of acceptance. When the face that looks at you is no longer the person you recognize (and vice versa), the bottomless pit of pain can barely be fathomed. The strings on the song formalize the feeling in the Emily Dickenson sense. Happily, all is not melancholy here. In fact, most of the tracks are upbeat. The songs’ characters may be unloved and disturbed, but aren’t we all? Mann sings “Life is grand” and then notes “wouldn’t you like to have it go as planned”. But she and we both recognize that life rarely goes as intended. Our scheming has unintended consequences. Our designs are not as well-formulated as we think. The people Mann describes seek meaning where there may be none. The world does not revolve around them. They are lost and fight against despair. But they are not losers. Mann’s expressive voice reveals that they hope against hope and still feel deeply despite efforts to numb themselves on cuts such as “Goose Snow Cone”, “Philly Sinks” and “Rollercoasters”. The end results may be mistakes, but that’s just the cost of taking risks and reaching out. You’d be crazy not to try and find love. Mann calculates that the rewards are worth the price.